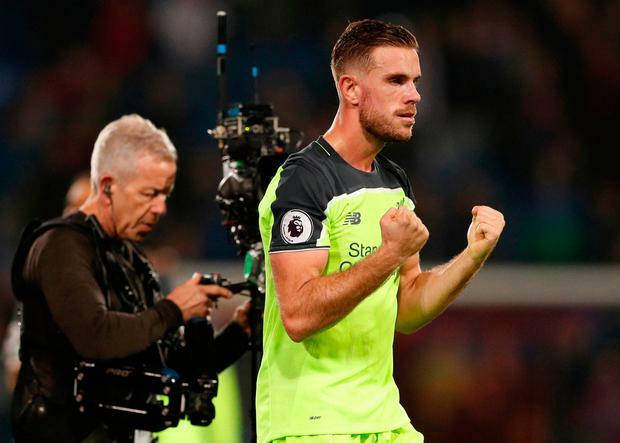 Liverpool midfielder Jordan Henderson (right) says it is too soon to talk about winning the title and the side must keep their feet on the ground after Saturday's 4-2 win over Crystal Palace kept them hot on the heels of Premier League leaders Manchester City. Liverpool, who won the last of their 18 English league titles in 1990, are unbeaten in eight league games and trail City and second-placed Arsenal only on goal difference after 10 games. While their impressive start has raised optimisim among their fans, Henderson played down the title talk. "We've just got to concentrate on our games," the England international told BT Sport. "We're not getting ahead of ourselves. We're focusing on the game ahead and want to keep it game to game." Goals from Emre Can, Dejan Lovren, Joel Matip and Roberto Firmino secured victory for Liverpool at Selhurst Park in a vibrant attacking display. However, concerns remain over their defence after James McArthur headed home twice to keep Palace in the game. "It's a difficult place to come," said the Liverpool skipper. "It was a battle throughout game but, in the second half, we managed the game well. Then we managed to finish the game off and, overall, we are delighted. "We need to look back at the game and at the mistakes, but we forget about that and moved on." Liverpool next host seventh-placed Watford in the Premier League on Sunday.